Learning to eat smart after 50 – is it too late? Absolutely not! The benefits of fresh, organic produce can’t be overstated, and yes – you can do it right at home! I invited Jess Elwert Peters of Jessecology – an experienced organic gardening expert – to share her best ideas for making it as easy as possible to eat healthy. Enjoy! There are so many health benefits from eating fresh, organic produce that it’s crazy not to. I regularly hear people complain about the higher prices of organic fruits and vegetables, or how difficult and costly time-wise it is to make the weekly trek to the farmer’s markets. Many of these people also believe that growing their own organic produce is not within their wheelhouse. 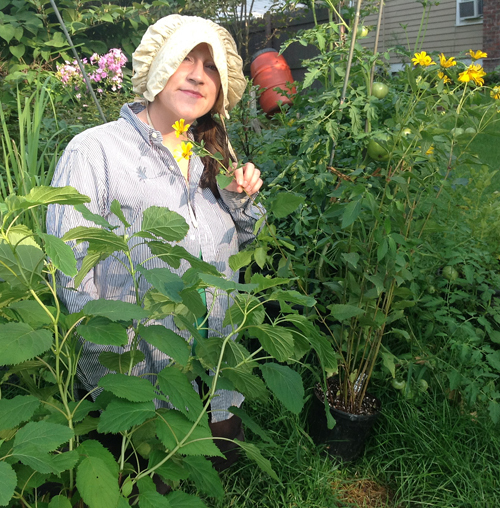 In my garden coaching and ecological garden design business, it has been a sincere pleasure to make edible gardening accessible for lots of folks over the years, and I hope to communicate some of the basic ideas here. When creating an edible garden for a first time gardener, I try to always use a raised bed , either a permanent or non-permanent one. This is helpful for many reasons. Primarily it gives us absolute control over our soil composition, we can purchase rich, organic, compost-containing soil (aka “brown gold”) to fill the boxes which translates to healthy, well fed plants. Additionally it limits the space we have to work with- which usually turns out to be a blessing as summer marches on and garden maintenance is simple. The watering and weeding necessary for a 4×4 square foot box is negligible- yet the crop potential of such a space, when companion planting principles and vertical gardening are utilized is surprisingly abundant. Companion planting is a critical piece of harmonious organic edible gardening experience. Drawing on time tested traditions, vegetables, herbs and even some flowers are planted in close proximity to attract the right pollinators and predator insects, or to repel a specific pest insect. One example of this is how basil and tomato plants should always be planted right next to each other: the basil’s pungent aroma is unbearable to the pesty “Tomato Hornworm,” and so we neatly evade Hornworm problems on our tomatos and even improve our tomato’s flavor with proximity to the basil. A similar relationship exists between all members of the squash family (cucumber, squash, melon and pumpkin) and the native perennial, Common Tansy (Tansy vulgaris). The cucumber beetle terrorizes squash family plants, it can erradicate a healthy vine in a week and a half. One organic preventative strategy is to co-plant some Tansy with our melons, cucumbers, pumpkins or squash, because the cucumber beetle hates tansy and stays away. 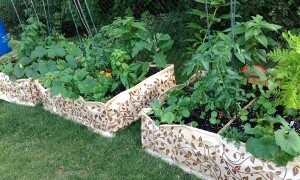 Within a raised bed, we get a lot more mileage of vegetables when we grow up, or use vertical gardening strategy. That is, every single thing that can possibly be staked or grow as a vine needs to be given adequate space to climb. I often encourage my clients to be creative and have fun in their choice of staking materials: an old ladder or an old wooden pallet have great potential for climbing substrate. In this way we can plant our seedlings relatively close together and as they fill in just manage their arial crowding. Not only do we maximize spatial productivity using vertical gardening, (more veggies and herbs) we also eliminate the space weeds can sprout in, and weeding as a chore is almost non-existent. I purchase my seedlings from an organic farmer at the farmer’s market, except for peas and greenbeans, which are easier to start from seed than transplant. So, when we grow organic vegetables in raised beds with our choice in high quality soil medium, when we use the traditional companion planting tricks coupled with vertical gardening in the raised beds, we create a nearly fool-proof recipe for a low maintenance and high output system. Food can become medicine when it is this fresh; when eaten within hours after harvesting, vegetable enzymes are still alive. Chlorophyl is still vibrant. Vegetables from the grocery store and even the farmer’s market don’t possess that kind of potency. Our bodies enjoy a wonderful, homegrown detoxification process with garden fresh vegetables and herbs. Explore more ways to eat smart after 50 with some of our recipes for baby boomers, particularly the Sweet and Savory Kale – exactly the type of superfood you can get from this type of gardening!